Popping Balloons is a Mini Battle from Super Mario World 2: Yoshi's Island and its remake Yoshi's Island: Super Mario Advance 3. Here, Yoshi has a contest with a Bandit to see who can pop the balloon with the Special Item in it. 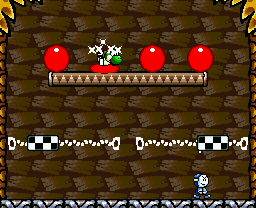 To pop a balloon, Yoshi must Ground Pound the balloon. This is the only Mini Battle that requires luck, seeing how as the player cannot see which balloon holds the Special Item. If the player pops the correct one, they will get either a 10-Point Star item or a 20-Point Star item. However, if the Bandit pops the correct one, the player will lose. Pound the ground to pop balloons. Find the correct one to win! This page was last edited on April 12, 2018, at 08:22.